The Retargeting & Audiences option allows you to serve your ads exclusively to users who are interested in your products or services. For example, you can serve them to people who visited your site already or put something in their basket. Yandex.Metrica and Yandex.Audience can help you select a user group. Ads based on retargeting lists will only be served on the Yandex Advertising Network and ad exchanges. Ads that concern personal topics (such as medicine, dating for adults, gifts and surprises) will not be served based on retargeting lists. Retargeting lists are a combination of goals and segments from Yandex.Metrica and Yandex.Audience that you can use to define your target audience. You must set up these services in order to create retargeting lists. Enter goals or segments in Yandex.Metrica. Goals relate to the behavior of a specific user on your site. For example, a goal might be for a user to add a discounted product to their basket or start a new order. Segments describe characteristics of a user during a specific session. For example, they describe how the user got to the site (from a social network, from Yandex search), what device they used to view the site (a mobile phone, desktop), and their gender and age. Decide who you want to see your ad and then generate a matching Yandex.Audience segment. For example, you can create a segment based on your customers or visitors from certain locations, or you can find new potential customers using Yandex technologies. You can add a retargeting list to an ad on the page where you create or edit ad groups. Either select one from the list of those created earlier or create a new one. 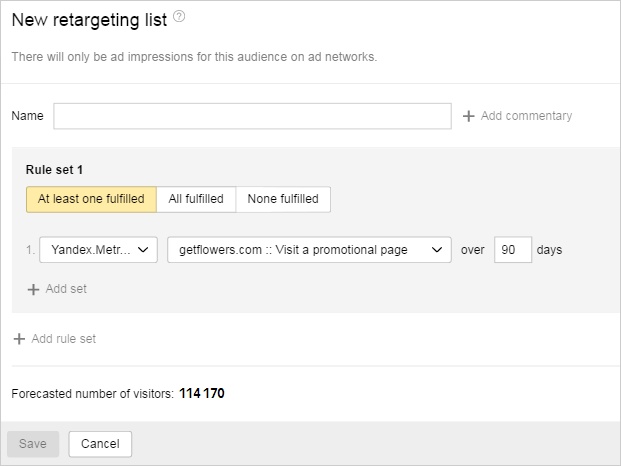 To create a new retargeting list, go to Retargeting & Audiences → Add. In the window that opens, click + add set. A condition can consist of one or more rule sets (but no more than 50) joined by the “And”operator. You can use Yandex.Metrica goals or segments in one set, Yandex.Audiences segments, or both (but no more than 250). Keep in mind that the more criteria there are in your retargeting list, the narrower your audience coverage. 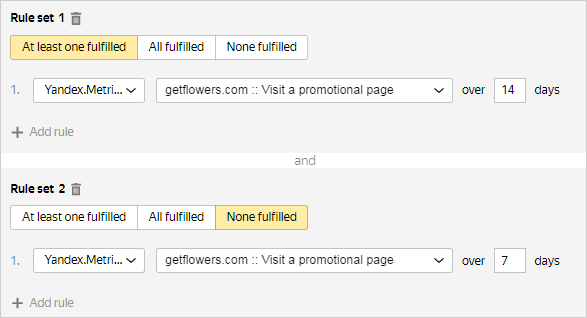 You can also request access to existing Yandex.Metrica goals or segments that are linked to another Yandex.Metrica tag and then use them to set up a retargeting list for your campaign. To do this, go to My campaigns → Retargeting & Audiences → Get access to Yandex.Metrica goals. The system lets you choose various criteria for rule fulfillment — All fulfilled, At least one fulfilled or None fulfilled. You can only use retargeting lists where all the rule sets are marked None fulfilled for bid adjustments. 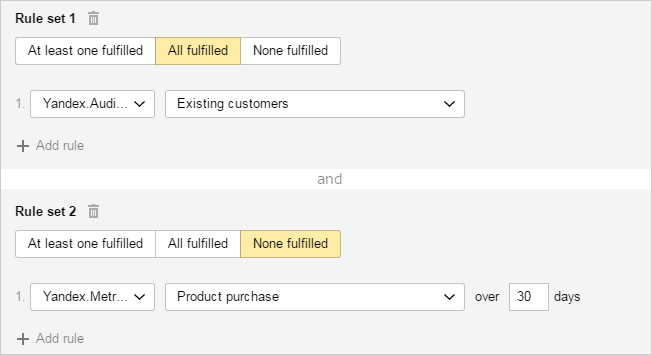 You can view all the criteria you created on the My campaigns → Retargeting & Audiences page. You can add a retargeting list to any ad group in one or more campaigns. You can create up to 2,000 retargeting lists per account. You can add up to 50 retargeting lists to an ad group. You can also edit a retargeting list that you created previously. To do this, go to the My campaigns → Retargeting & Audiences page, click the retargeting list, and enter your changes. 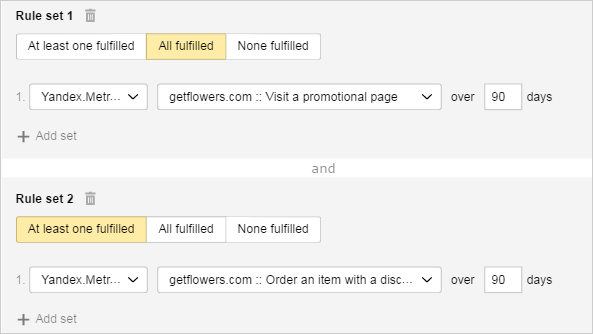 You can also create a new retargeting list that keeps the changes you made by clicking Save as new. You can set a specific time interval during which a goal should be met or a user should end up in a Yandex.Metrica segment. For example, you must set a period of between 7 and 14 days ago. You need to create two groups to do this. Add a goal with a period of 14 days and the At least one fulfilled criteria to the first set. For the second set, add a period of 7 days and the None fulfilled criteria. If you combine several goals in Yandex.Metrica, only users who complete all these goals in one session will end up in the sample. For example, if a segment was created in Yandex.Metrica with the two completed goals “Visit a promotional page” and “Order a discounted item”, the selection will include only users who have both visited a promo offer page and ordered a discounted item in the same session. To include those visitors who have fulfilled both criteria regardless of the time period, create the following two separate criteria in Yandex.Metrica: “Visit a promotional page” and “Order a discounted item”. Then combine them on Yandex.Direct. You can't create goals based on negative criteria in Yandex.Metrica. 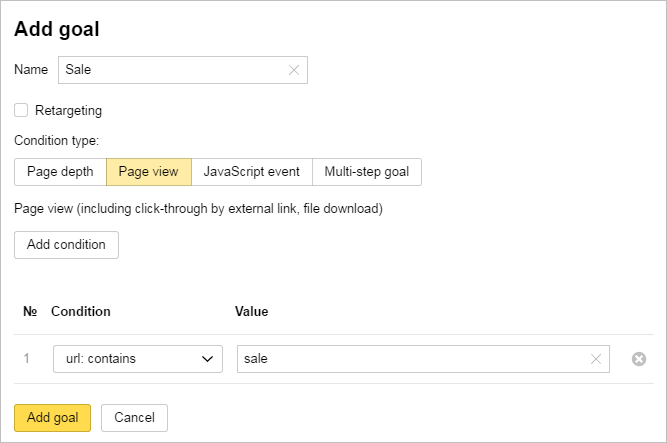 Instead, create a goal with a positive criteria and add a negative on Yandex.Direct. For example, you can't create a goal like “Item not purchased”. Instead, create a goal with the positive criteria “Purchase made” and then add a negative state to it: “Purchase made” — None fulfilled. 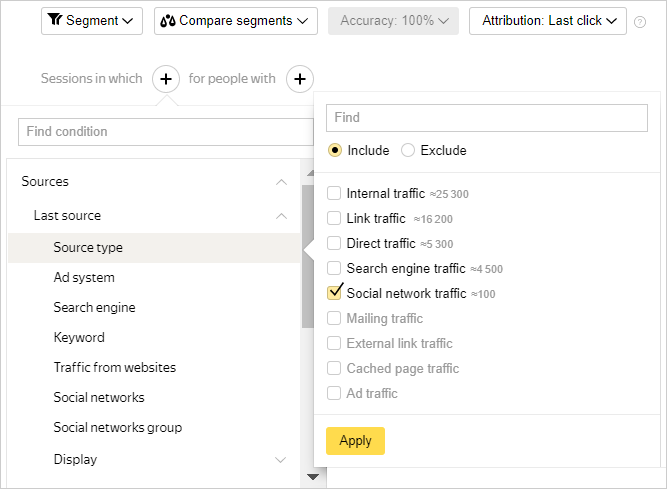 By combining Yandex.Audience segments with Yandex.Metrica goals and segments, you can create sophisticated criteria for retargeting lists. For example, you can serve ads for discounts to existing customers who have not made a purchase on your site in the last 30 days. To do this, create a segment of existing customers based on data from your CRM. Enter the segment and the corresponding Yandex.Metrica goal in the target audience section. Retargeting lists allow you to find users that are your potential customers (for example, people who have already been on your site). By increasing your bids for ads based on retargeting lists, you can reach more users interested in your product or service and serve them more relevant ads. You can set a bid for each retargeting list if you are using a manual bid management strategy. You can also use bid adjustments to raise or lower your bid when your ads are served. For example, you might want to target users who are interested in expensive goods or services. It is generally a good idea to set a higher bid for this type of group in order to get more traffic. More information about bid adjustments. Sometimes one user satisfies the impression criteria for several different ads. In that case, the user will probably be served the ad with the higher bid (in other words, the advertiser that considers that user's group most valuable will win the auction).